Your life will change for the better if you get the best cosmetic nose job for your face. If you trust your surgeon and have realistic expectations of the outcome, you will come away with a more visually appealing nose that sits in perfect facial harmony with the rest of your features. You will, however, need to be prepared for how a nose job changes over time. These are not negative changes but changes that lead towards your recovery and unveil a beautiful, new nose. After your nose job, you will need to rest. Do not bother looking at your nose to see if any changes are visible. At this point, it is too early to tell under the swelling. 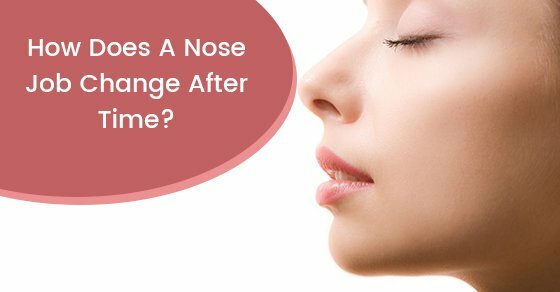 It is completely normal for your nose to swell following a surgical procedure. This is your body’s natural healing process and no cause for concern. You will be wearing a splint and protective bandages to protect your nose. These will be removed and your nose will have a basic shape without any visible definition. There will be some swelling; however, the bridge of your nose will now appear more prominent or less shapely depending on the purpose of the surgery. The swelling should be drastically reduced at this point in time. Now, you’ll be able to really notice the changes to your nose. The bridge of the nose will see major definition and the tip will have settled into its new position. For some people, the swelling will have gone down completely after three weeks while for others, it can take another week or so. The changes between three weeks and three months are minimal. The six-month mark is when the results of your cosmetic nose job really show. The tip of your nose will have proper definition and the sides and bridge of your nose will appear in symmetry with the rest of your facial features. Depending on how easily your body recovers from surgery, it could take up to two years to see the full results of your nose job. For the most part, the results of your cosmetic nose job is permanent. But, if you have an accident, experience breathing issues, or start to see the effects of aging in your face, revision rhinoplasty is available. This is basically a nose job that restores the form and function to your nose so that it looks exactly the same as when you had your first surgery.